Brazoria County contracted GCE to provide preliminary and final engineering services for an approximately 2.2-mile section of County Road 101 from CR-90 to FM-1128. The project included the removal of the existing 2-lane, 20-foot wide asphalt pavement with open ditches and construction of a new 4-lane curb and gutter concrete boulevard section with twelve-foot wide lanes in each direction and six-foot wide sidewalk. GCE’s services included environmental impact analysis, hydrologic and hydraulic analysis, drainage design, and traffic studies. GCE’s preliminary hydrologic study indicated that the existing drainage system was inadequate, which resulted in extensive, prolonged ponding and flooding after heavy rains in the project vicinity. An extensive drainage study was conducted to determine the impacts related to the proposed widening of CR-101 within project limits and to provide for mitigation measures that alleviated existing drainage problems within the project vicinity. The storm sewer system was designed to convey peak flows from 100-year storm intervals. Existing HEC-HMS and HEC-RAS models for Mary’s Creek were updated to study any impacts due to proposed improvements. Steady and unsteady flow simulations were performed using HEC-RAS to determine the peak flows and water surface elevations along Mary’s Creek for offsite storm water detention alternatives to achieve no impact conditions. A street ponding analysis was performed using City of Houston’s HouStorm model. Work also included a Traffic Signal Warrant Study at two intersections, traffic signal design, and preparation of a Preliminary Engineering Report (PER) that included preliminary plans for the project. In addition, relocation of utilities such as sanitary sewer, water, electricity, gas, etc. facilitated the proposed widened roadway alignment. 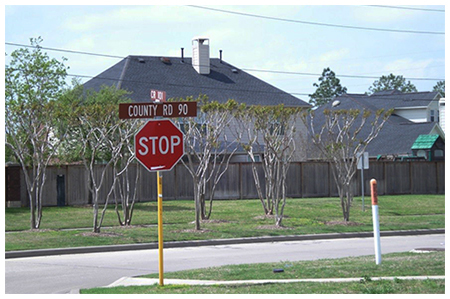 GCE coordinates with the City of Pearland, Brazoria Drainage District No. 4 and other agencies to ensure that the project is up to standards.